The Gibson Guitar Corporation manufactures both acoustic and electrical instruments, including banjos. Gibson has made many different styles of banjos, and bluegrass musicians prize Gibson’s Mastertone banjos for their rich sound. Gibson banjos carry decals, serial numbers and other physical features that can help you learn more about your banjo. Examine the Gibson logo on the peghead, the part of the banjo where the tuning pegs attach. In 1946, Gibson changed the logo on all their instruments from script lettering to block letters. Any instrument with script lettering was made before 1946 and is called a "prewar" model, while block letters indicate a "postwar" model. 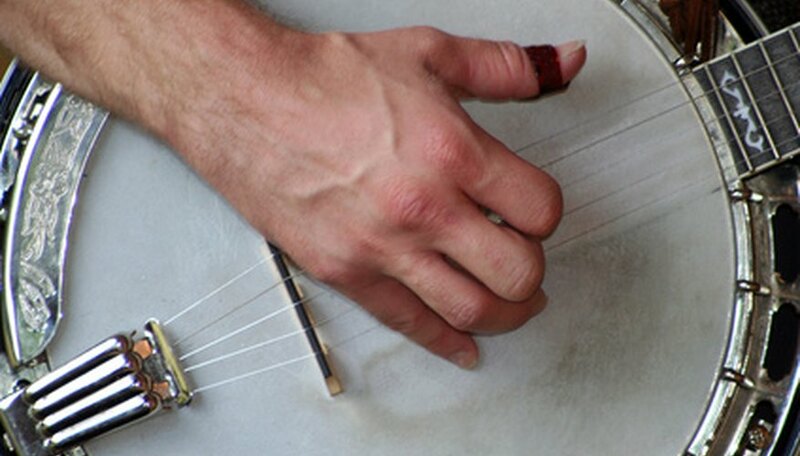 Look for a Gibson decal on the inside of the wooden rim that forms the body of the banjo. If your banjo is a Gibson Mastertone, "Gibson Mastertone" is written at the top of the decal. If it isn't a Mastertone, the oval decal will be smaller and will have "The Gibson" written in script, with "Gibson Inc. Kalamazoo Mich." in block letters beneath it. Look for the serial number on the back of the peghead. A serial number is an important piece of information in establishing the authenticity of your banjo. Remove the back of your banjo--the resonator--to see the serial number if it isn't on the back of the peghead. Loosen the screws attaching the back to the banjo. The screws are large enough that you can do this with your fingers, and a screwdriver won't be necessary. You may see the serial number stamped into the wooden rim of the banjo's body or written inside the resonator in chalk. Check that the configuration of the serial number is right for the time period. Go to the official Gibson website or check a list of Gibson serial numbers (see Resources). These lists will tell you what year your banjo was manufactured and what style it is. The numbering system used by Gibson to choose their serial numbers was counterintuitive during their prewar period. Knowing if your Gibson banjo is a prewar or postwar model will help you understand the serial number. There are many styles of Gibson banjos, and there is a lot of variation within those styles. Even if your banjo doesn't match the description of a Gibson exactly, it may still be one. The prewar Gibson Mastertone banjo is the rarest and most valuable model of Gibson banjo, so it is the most likely to be faked.